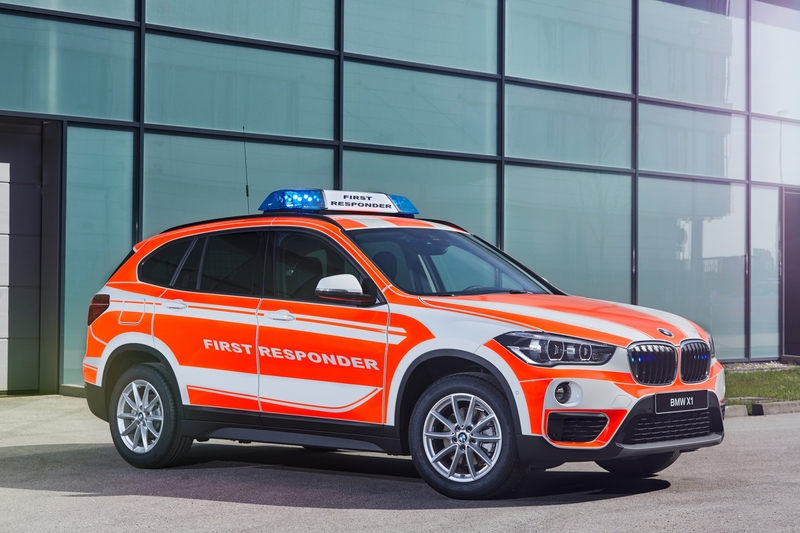 This is BMW's take on the service class. 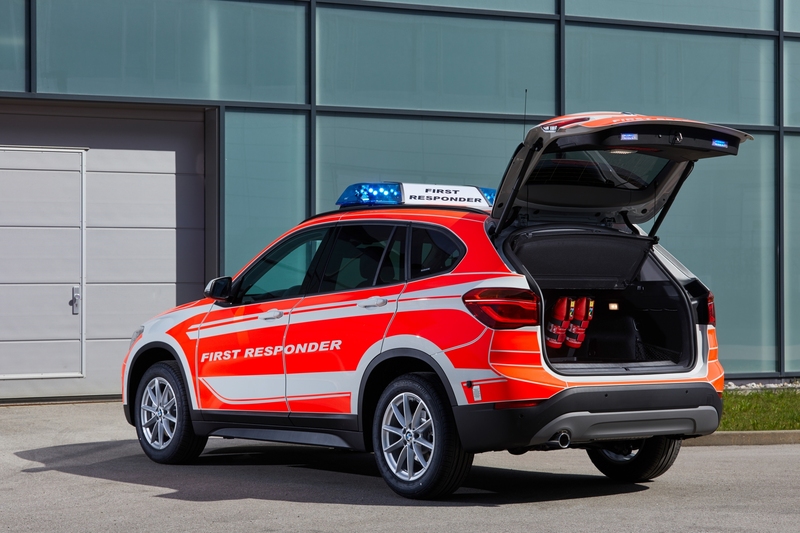 BMW Group is displaying a wide range of its tailor-made vehicles designed for rescue teams, fire departments, emergency physicians, and police forces at the specialist trade fair RETTmobil 2018 held in Fulda, Germany from May 16 to 18, 2018. 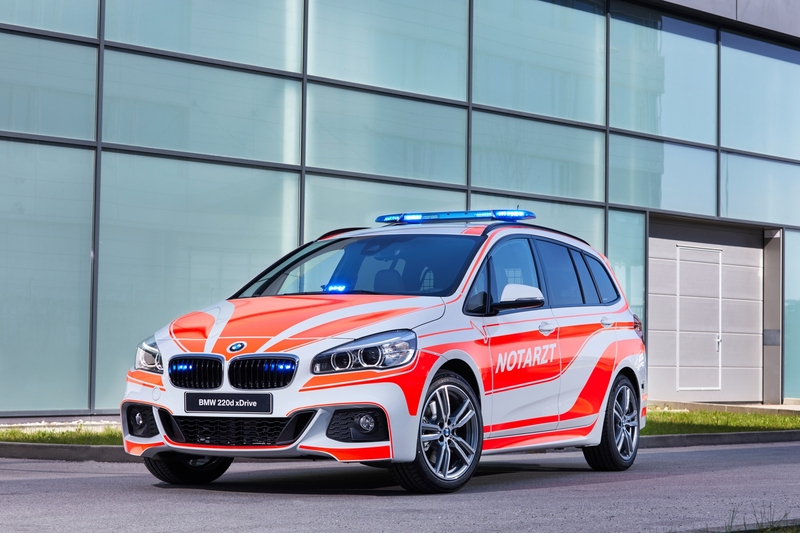 The RETTmobil, which is in its 18th season, is a prominent European exhibition for emergency services and BMW Group is using this venue to showcase six special-purpose vehicles under the BMW, BMW Motorrad, and MINI brands. 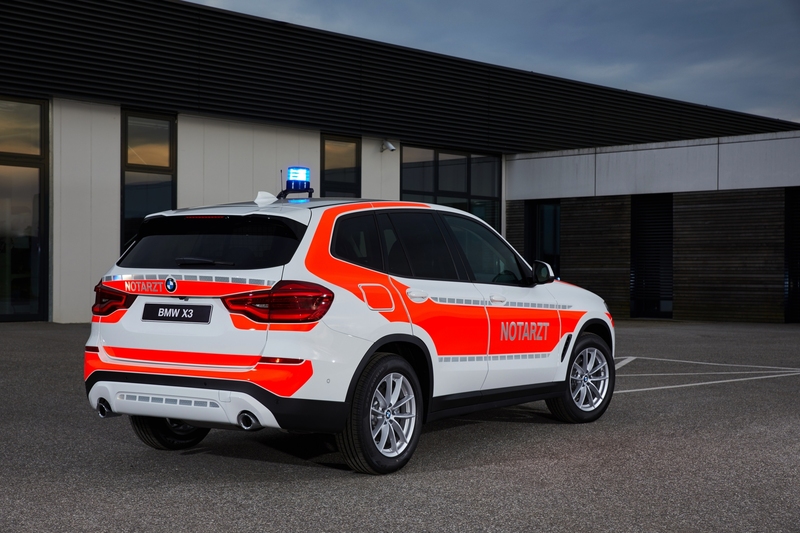 Among the six, two will be variants of the new BMW X3 xDrive20d. One in "fire service command vehicle" guise with decals in fluorescent yellow and rich red tone RAL 3000, bearing the “Fire Department” lettering on all sides. It comes equipped with blue LED front flashers, digital radio antenna for GPS etc. and radio handsets. 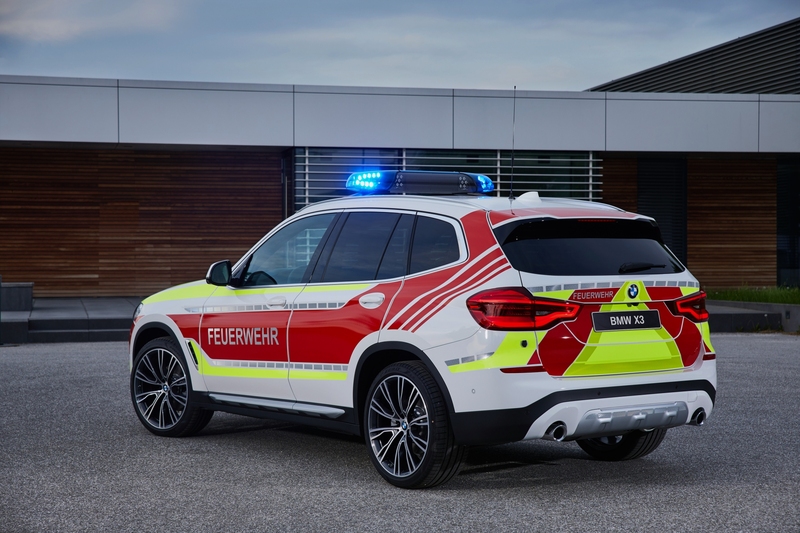 Then there's another designed for the emergency physicians. 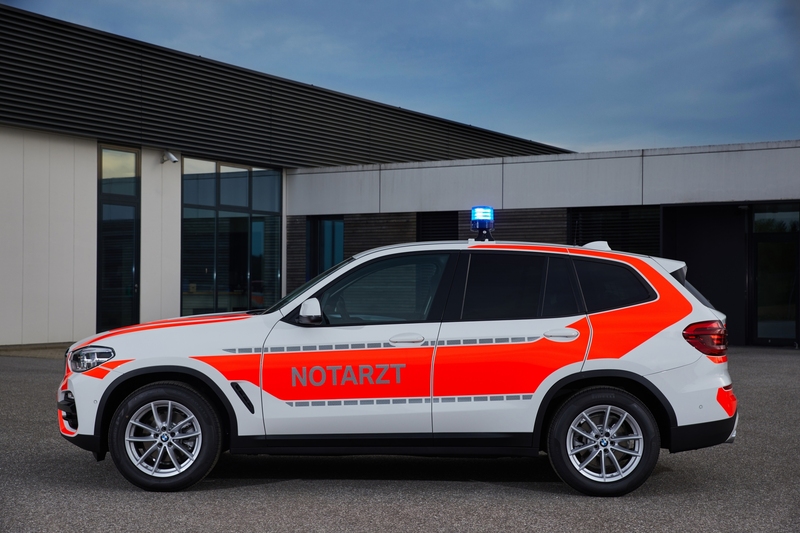 It bears decals in bright color RAL 3026 with “Emergency Ambulance” lettering and comes equipped with a removable omnidirectional beacon and two blue flashers at the front and rear. 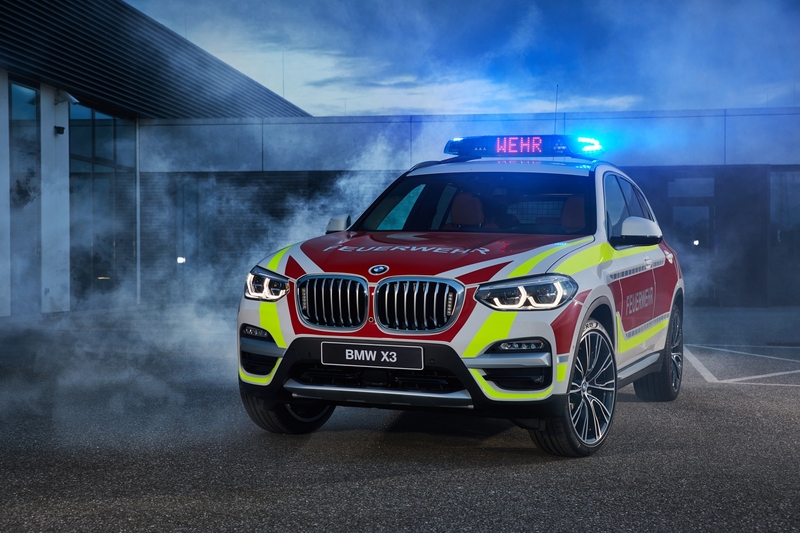 In European spec, both xDrive20d models come powered by a 2.0-liter, four-cylinder turbo diesel engine delivering 188 horsepower and a maximum torque of 400 newton-meters and is mated to an eight-speed Steptronic transmission and xDrive, BMW's intelligent four-wheel drive system. 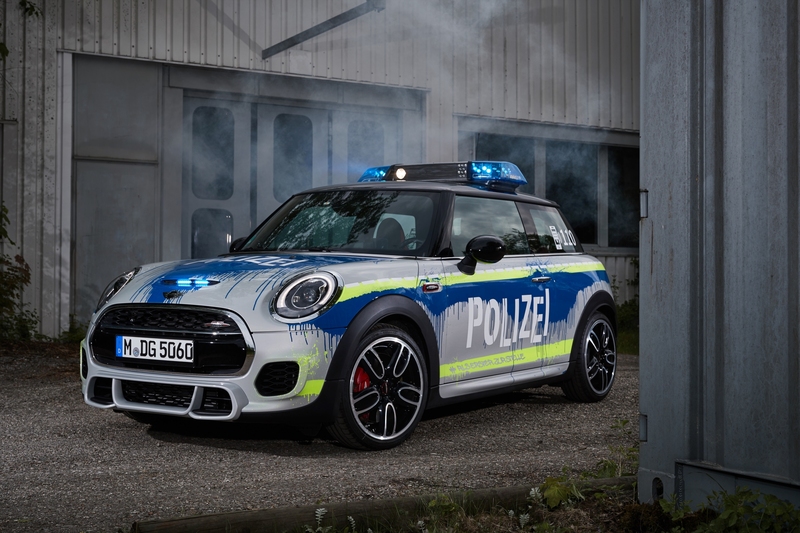 It can accelerate from zero to 62 mph in just eight seconds. 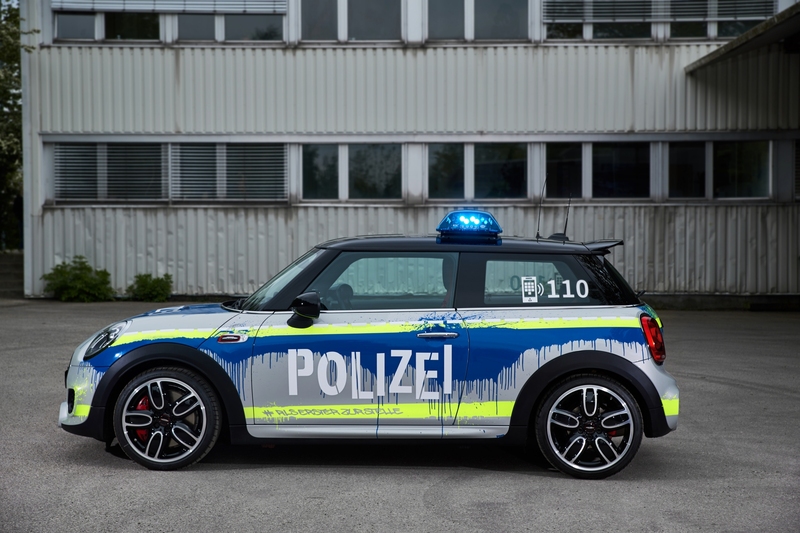 Its top speed is 132 mph. 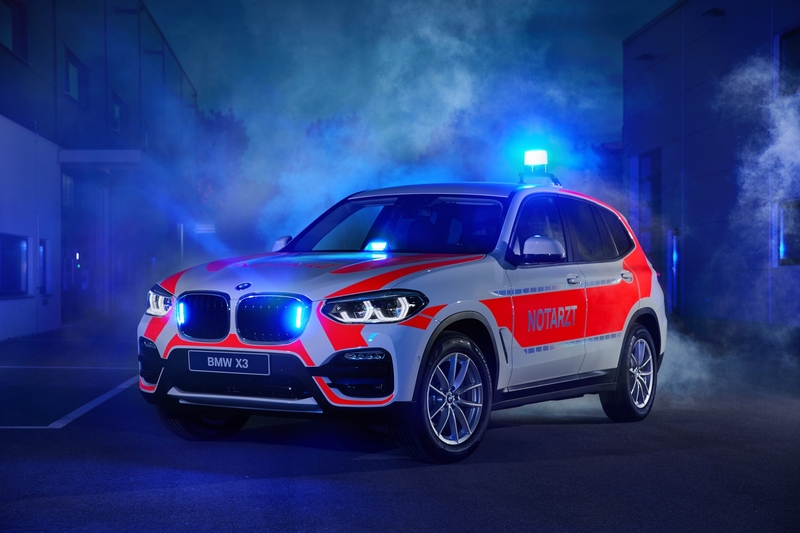 BMW Police Car Explodes into Flames for Unknown ReasonBy Max Goldberg Posted in Emergency! 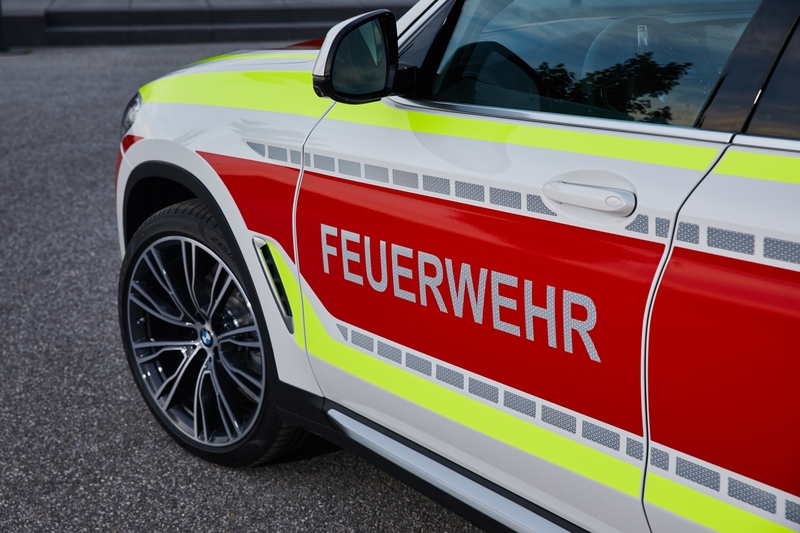 Emergency Services Turn to Social Media to Connect With the CommunityBy Max Goldberg Posted in Emergency! 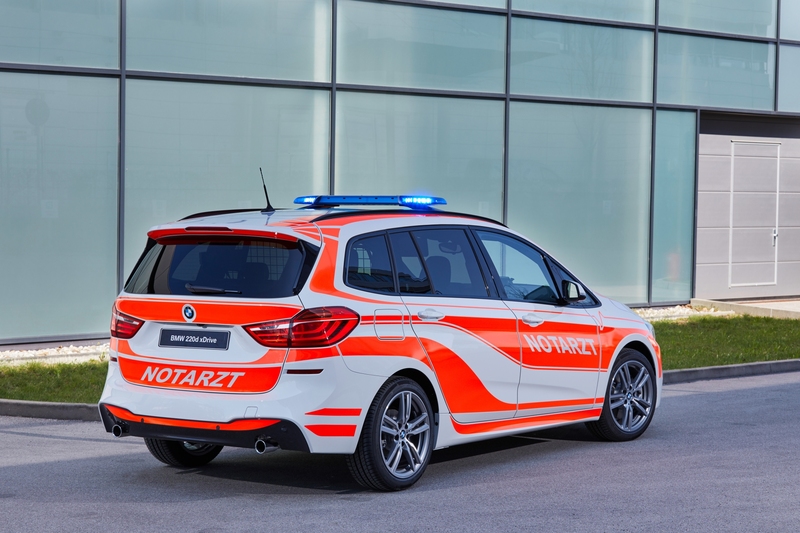 Also on display and driven by the same powertrain will be the BMW 220d xDrive Gran Tourer for the emergency physician with high-visibility livery and blue and yellow flashers. 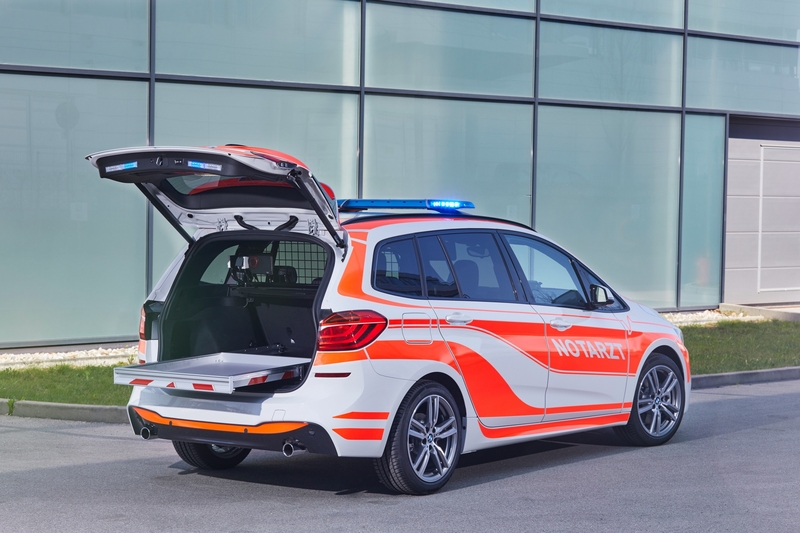 With a high-seating position, large doors, a durable loading floor, and a longitudinally adjustable rear seat, the Sports Activity Tourer can be transformed into an emergency ambulance. 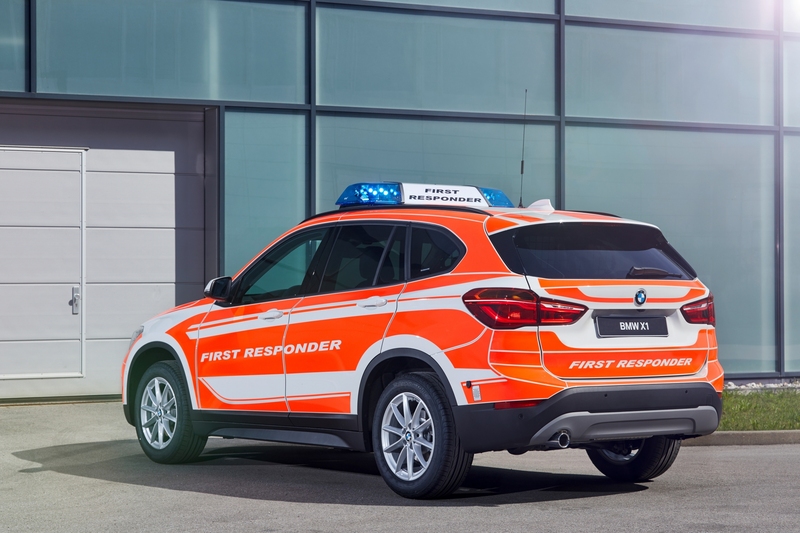 First Responders have been designated the BMW X1 xDrive20d. It is suitable for “wide spectrum of applications”. And it too gets some livid livery in a mix of white and orange, and blue flashers. 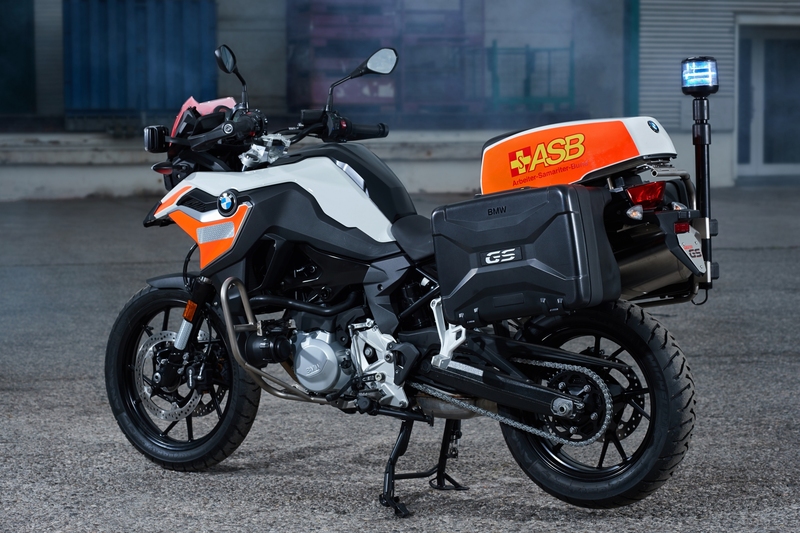 Introduced as a “public authority vehicle," is the new-generation BMW F 750 GS motorcycle. It combines long-distance touring with sporting dynamics and off-road capabilities. 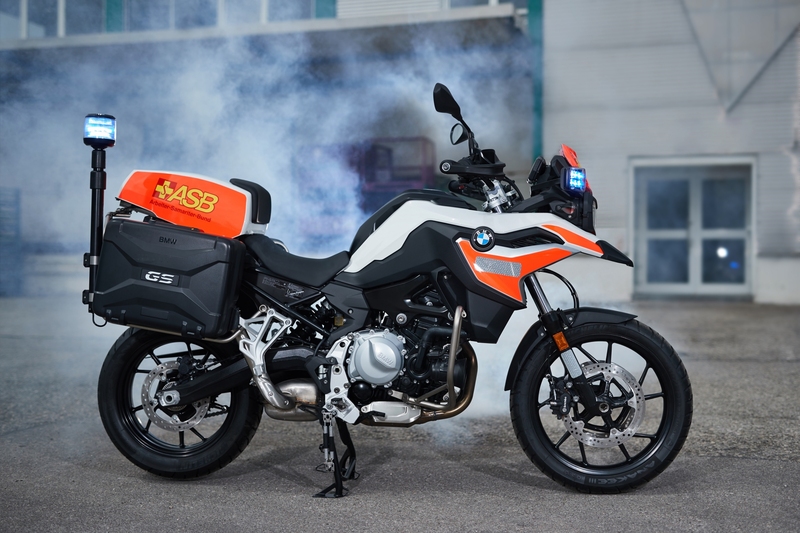 The motorcycle’s optical equipment features include LED flashing beacons as well as an additional LED rotating beacon, switchable between the colors blue and yellow. The entire light system and siren are effectively controlled via the compactly designed control panel. 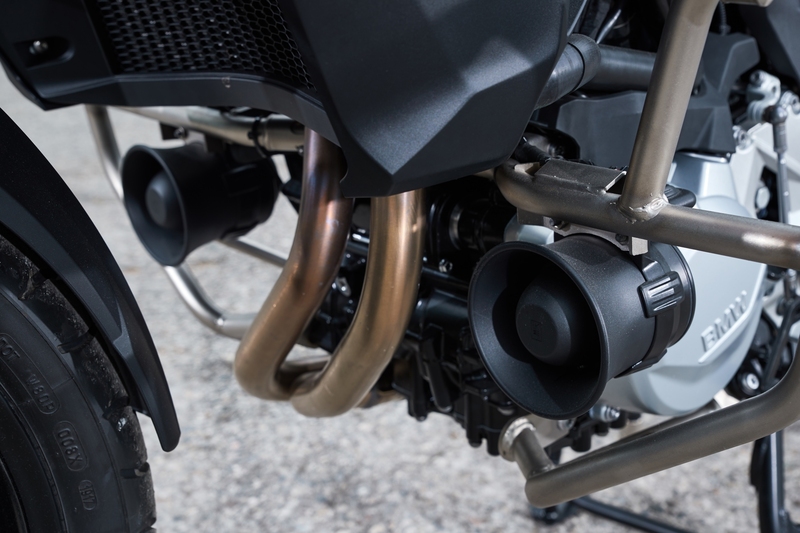 The bike is powered by an 853 cc two-cylinder, four-stroke inline engine producing 76 hp and 83 Nm of torque. 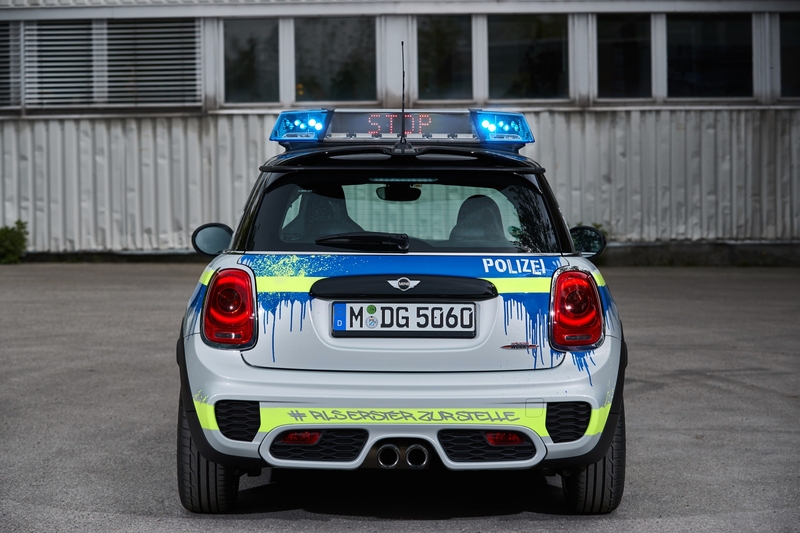 Average fuel consumption is 57 mpg and it tops out at 118 mph. Style elements inspired by both the Union Jack and Stars and Stripes flags, and 3-D printed parts make this a unique car for the unique nuptials. The use of social media has established a bridge between the community and those who protect it.